"Truly Madly Deeply" Collection is all about love! Are you looking for the perfect kit for an anniversary, Valentine's Day or just to let someone know how much they are loved??? This is the kit to choose! Great colours for both a female or male theme; this fits the bill. Tell someone today how much you love them, and share in the warmth that they will feel. 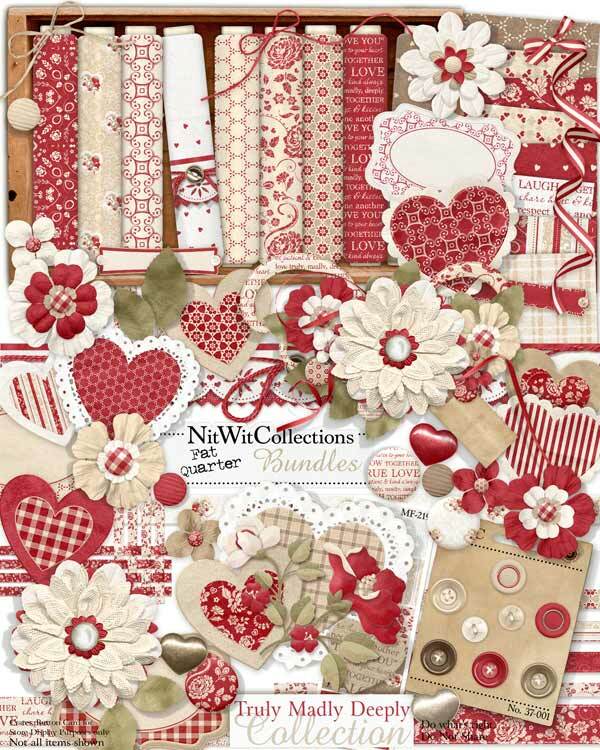 Don't miss the quick page layout that is included in this kit! 2 Borders with a string tying it all together! 1 Braided corner element. Look at how they are woven together! 8 Buttons in the colours to match this digital kit. 1 Cluster of hearts...now what feeling does this resemble?? 4 Fabric buttons, good enough looking to sew onto your favorite shirt....but I think not. 1 Digital scrapbooking quick page layout. Several spots for you to add your pictures...see our layout in the images above to see the entire quick page. 3 Paper hearts - OK digital paper hearts! 7 Ribbons in colours and patterns to compliment this kit. 1 Ribbon curl - then my scissors got tired!